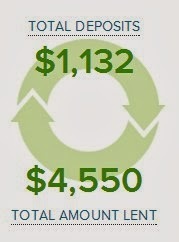 My Kiva Experiment is working…I’m excited to share that I just lent out my 50th loan through Kiva. As you can see in the image to right, my initial deposit of just over $1k has been relent over and over to total $4,550 in value…now that’s what I like to call return on your investment! I’ve now lent money to 50 groups of people in 26 countries. Eventually I would love to give loans to people in all 73 Kiva Countries, but the truth is that I’m called to lend more in some areas of the world, especially Africa. I’ve also decided to be rather random and spontaneous in my selection process, so it often depends on who happens to be featured first. If it’s a vocation/place that I would like to support, I’ll often lend to the first one on the list, like I did this time. However, I do take enough time to read through the lending details, since I would rather give to lenders who have loan terms of more than 18 months. If I can find a loan that six-months, then it means that money can be lent twice in a year. That’s not my only criteria, but my aim is to keep the average loan length under a year. When I started my experiment, I also decided to only lend out in increments of $100 dollars. I figure that keeps ten loans going at any one time, and that’s plenty to keep tabs on. Lastly, giving this last loan really made me smile. It was a loan to the Hodari Group in the Congo. The groups buys second hand clothing in large bales that has been shipped from around the world. When I visit sis in the Peace Corps in Ghana, we went to the second hand markets…the direct translation was “Dead White Guy Market,” since they figure the person must have died to give away such nice clothes! My Twin Sis has also worked a great deal in the Congo and I have an inspiring friend in my Rotary club, so I’ve made several loans to the Congolese. It’s such a beautiful war-torn place…if you really want to help there, you can donate to my friend’s EduCongo project to build schools. This entry was posted in giving back, Money Stories, Yippie on October 30th, 2013 by Darcy Cronin. Excellent return. Keep it up.